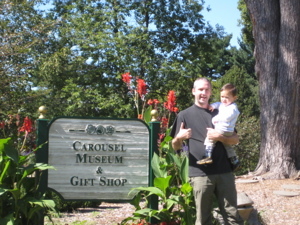 I did not know there was a “carousel museum” at the Beardsley Zoo (CTMQ Visit Here!) until I saw a sign stating such. After poking around inside I never really saw “museum” type things. Actually, after googling it at home for a few minutes I still was not convinced. I have my two pieces of corroborating evidence and now I shall report. On this so-called museum. Place. Thing. After checking out the Beardsley Zoo for a couple hours, we almost left without seeing the carousel. Damian has never enjoyed riding them (here at the historic carousel at Lake Compounce and here at Bushnell Park’s carousel). 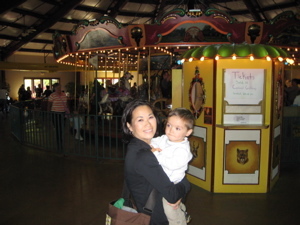 However, Hoang wanted to see everything the zoo had to offer, so we walked up to the carousel building. That’s when I saw the sign; a museum! A museum not on my list?! I was woozy with confusion and excitement – just go with me here. 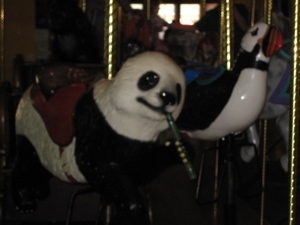 Once inside, I quickly noticed that there really wasn’t anything explaining the carousel or carousels in general. 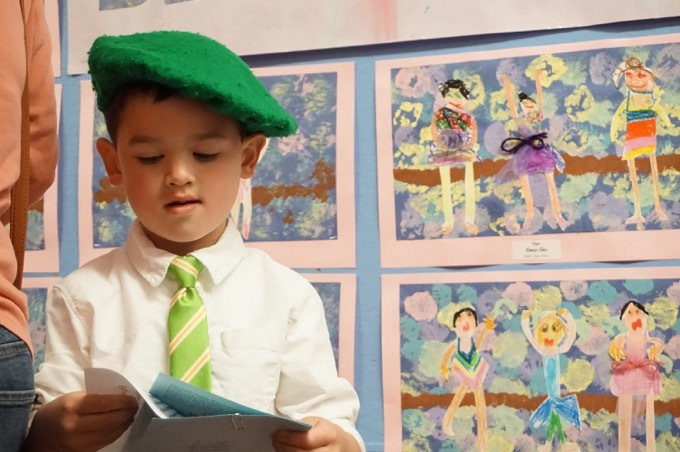 Then again, with a Carousel Museum in Bristol and the Bushnell Carousel in Hartford (which is actually part of the Bristol Museum), there’s enough in the state to teach us about carousels. Even though this one is much quieter and slower than the other two he’s ridden, Damian still wasn’t into it. 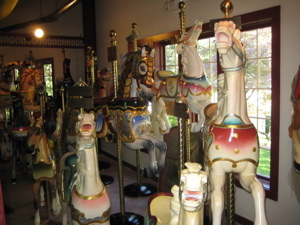 So we walked along the rounded walls and noted the 70 or so historical carousel mounts. They were pretty much just all horses – which is weird because the working carousel had all sorts of animals on it, playing up its location at the zoo. Definitely unique and pretty cool. Many of the mounts were from Pleasure Beach, a now abandoned Pleasure Beach – a CTMQ Curiosity waiting for me to visit. Pleasure Beach is the Bridgeport portion of a Connecticut barrier beach that extends 2-1/2 miles easterly from Point No Point (CTMQ Visit here). From 1892 until 1958, it was home to a popular amusement park of the same name. From 1904 to 1919, it was called “Steeplechase Island.” The island was accessible only by ferry service and a wooden swing bridge built in 1919 to carry automobiles and pedestrians. 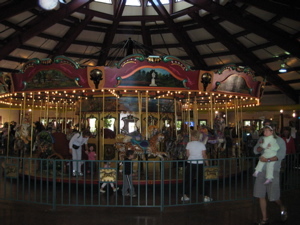 Remaining structures from the amusement park are the carousel, dodge-’em car enclosure, and beer garden. After a portion of the bridge burned in 1996, Pleasure Beach was cut off and became accessible only by a lengthy trek along the shoreline, or by small private boats from the mainland. This has severely limited access and allowed nature to be undisturbed. The bottom line here is that this isn’t really a museum, but since they have a sign and the town saying it is, I’m not going to argue. I learned nothing here at all, except that flying panda bears eating bamboo look kind of creepy. I have no idea what the thing on the left was supposed to do, but Damian didn’t care. 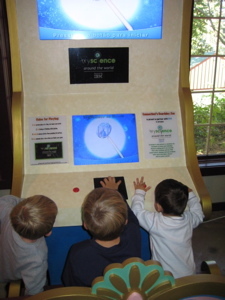 He’s afraid of carousels, but not afraid to sidle up next to random kids and start pounding the red button on their game. Wow..Amazing Carousel Museum, someday I want to go there. 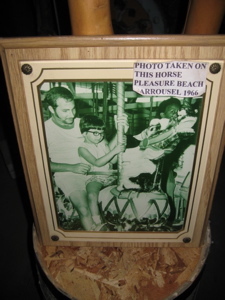 My nana worked at the kiddie rides on pleasure beach. I wasn’t allowed on the big rides but I spent many hours on the carousel. I am so happy the horses have been saved. If I ever get back there I will definitely visit.